With the end of summer comes a period of reflection for us. The evenings are getting cooler, the garden produce has slowed down and some veggies have already reached the end of their life cycle. So, the big question - did we complete our challenge? Were we able to limit our veggie and fruit intake to what came from our garden for three consecutive weeks? To recap - we issued ourselves with the challenge to grow enough fruit and veg to rely only on garden produce for three continuous weeks. We set out to build a vegetable and fruit garden that would supply all of our fruit and veg, or as close as possible, for three weeks - from fruits to greens, herbs and edible flowers. 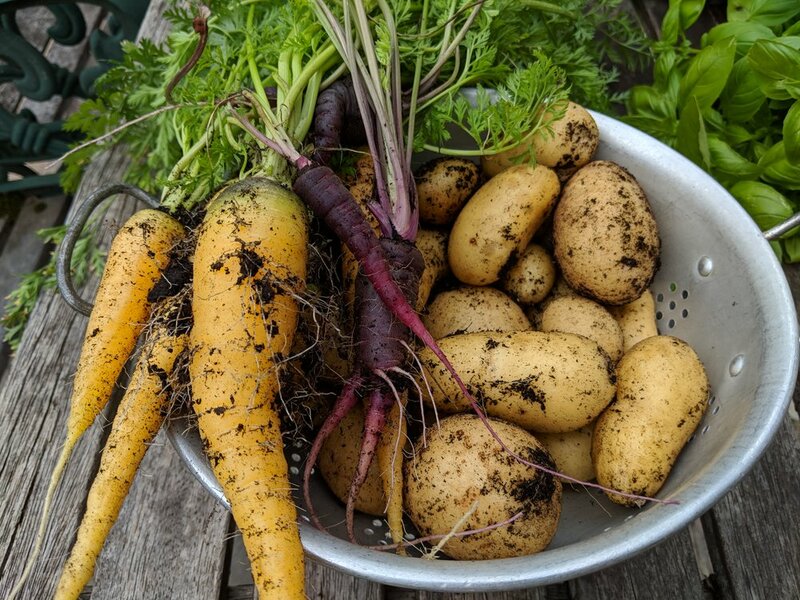 This blog series has detailed each month's activities in the hope that we can encourage you to start growing your own food at home, no matter how small the space. So - how did we do this summer? The bad news is, we weren’t able to feed ourselves for three consecutive weeks - but the great news is, we were able to feed ourselves for 2-3 months, just not exclusively from garden produce. We had so much more food in our garden than expected, growing everything from onions to figs, rhubarb to carrots, sweet potatoes to almonds! 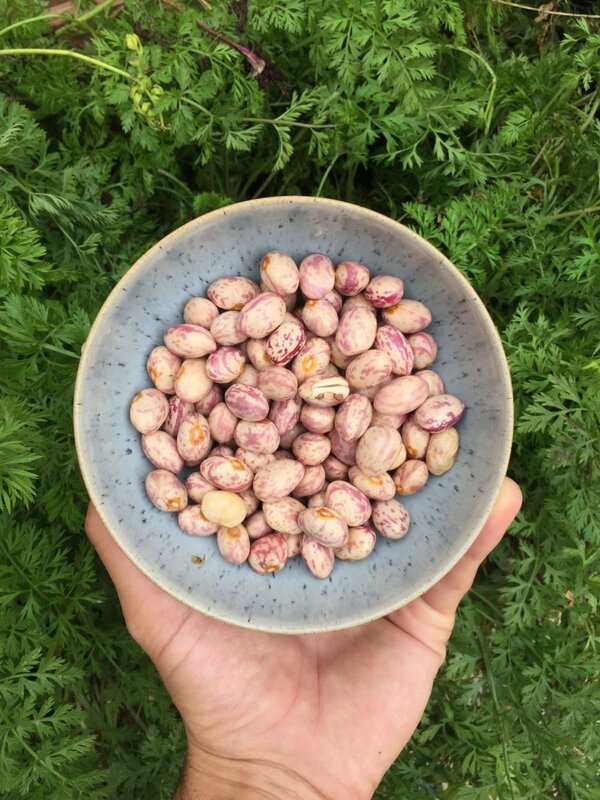 It’s been so fantastic to see what we can grow in a small urban garden in London. Yes, we had an exceptionally warm summer, and that helped with most of our fruits and veggies, but we’re really happy with the amount of food our space has been able to produce. 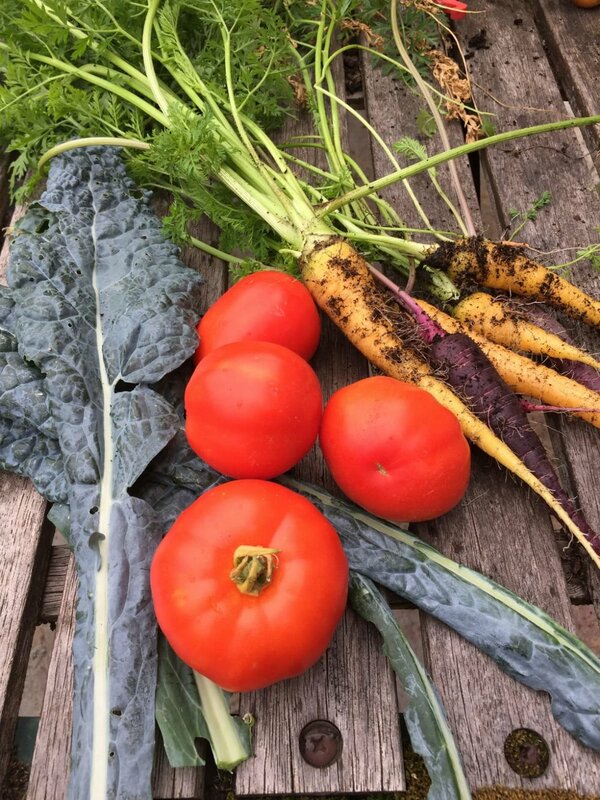 Below are some of the vegetables and fruits we have grown in our garden. The king of the cropping vegetables - tomatoes - took a knock earlier on in the spring as young plants, but they gave us a huge harvest. We had a total of 8 plants, mostly producing vine cherry tomatoes, but we had enough tomatoes to give to friends and family and still were able to make plenty of sauces, roasted tomatoes and salads. We are on to a winner here! We’re not so sure they’ll grow as well next year, as we don’t know if it’ll be so warm, which is the ideal climate for tomatoes, but we love the smell of the plants - plus we didn’t buy any store-bought tomatoes from July onwards. That’s a victory in our eyes! 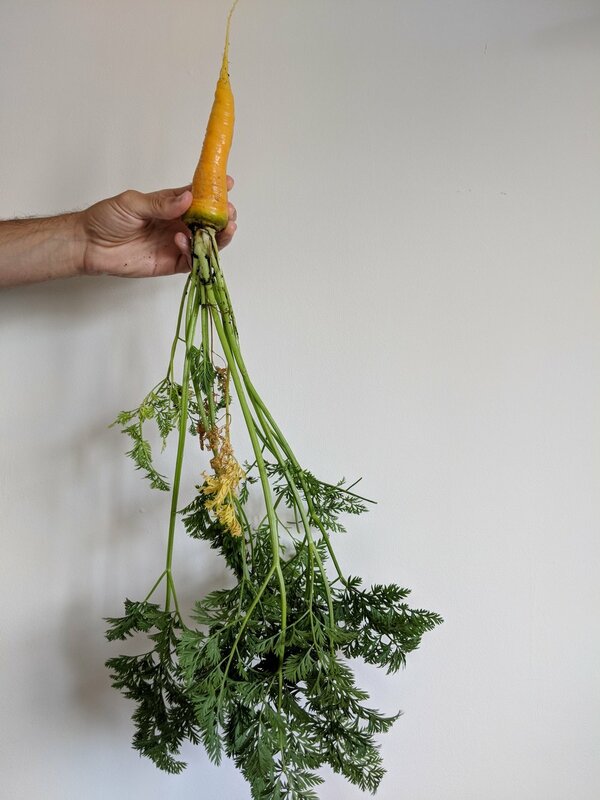 At the time of writing this, September (we were busy planning our early-September wedding, so this post is a bit late), we still have plenty of carrots in the ground. As you might know, we planted a variety of carrots sent to us by Mr Fothergill’s. We planted a combination of colours: yellow, purple and orange - and so far, we have harvested a few, throwing them into stews or roasting them in the oven. We love the idea of having a (seemingly) ever-lasting supply of carrots from July until January! We weren’t too fussed about growing potatoes, as we tried last year and the return was pretty poor. We only tried again this year as we had some chitted potatoes lying around and some empty space in the garden in the shade. Despite these conditions, they grew really well - maybe it was a nice break from the blistering sun! The potatoes came out really well and perfect for roasting and boiling. We will try these again next year. Beans have been a real winner this summer. 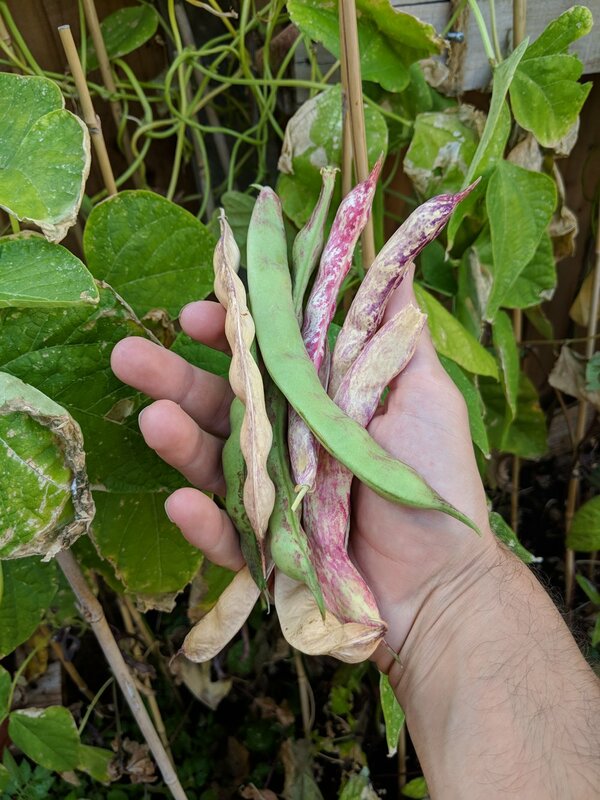 We started off with broad beans (a complete failure due to blackfly), then in June/July our green beans - a purple variety - were harvested, and throughout August our delicious borlotti beans were ready for the picking. These were fantastic in soups and stews. We only had 2 or 3 plants, but they climbed over 7 feet. Make sure you give them space. They’ll feature again next year for sure. This year we grew three types of kale in the garden. Curly-leafed kale, purple kale and Cavolo Nero. The Cavolo Nero was the only kale plant that wasn’t largely eaten by insects - even though some leaves took a chomping. We really enjoyed growing the Cavolo Nero, which we placed in a shady spot of the garden. We’re hoping to grow it again next year. The cucumbers performed really well again this year. We thought we’d have a small crop after many of the seedlings died earlier on in the year, but we’ve had lots of yellow crystal apple cucumbers, which we’re thrilled about. Our only problem has been finding enough people to eat them! They climb really well, and they always raise an eyebrow with friends as no one has seen these weird little cucumbers before. The peaches and figs were a huge surprise for us! Mr Fothergill’s sent us a miniature peach tree tree earlier on in the year, and it did not disappoint! We are quite sure we kept it in a pot that was too small, so in the blistering heat we had a few problems with under-watering - we were surprised it survived. On top of this, our fig tree gave us figs, too! 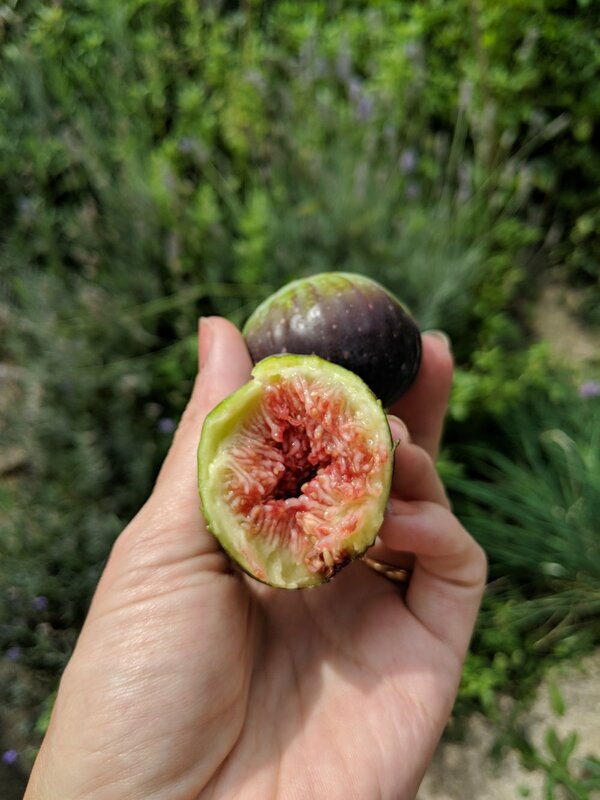 Our neglect towards our two potted figs amounted to nothing, but our fig tree growing in the ground produced a good few handfuls of figs over late August. What a treat! Our rhubarb plants have been consistently growing since March and are always reliable. 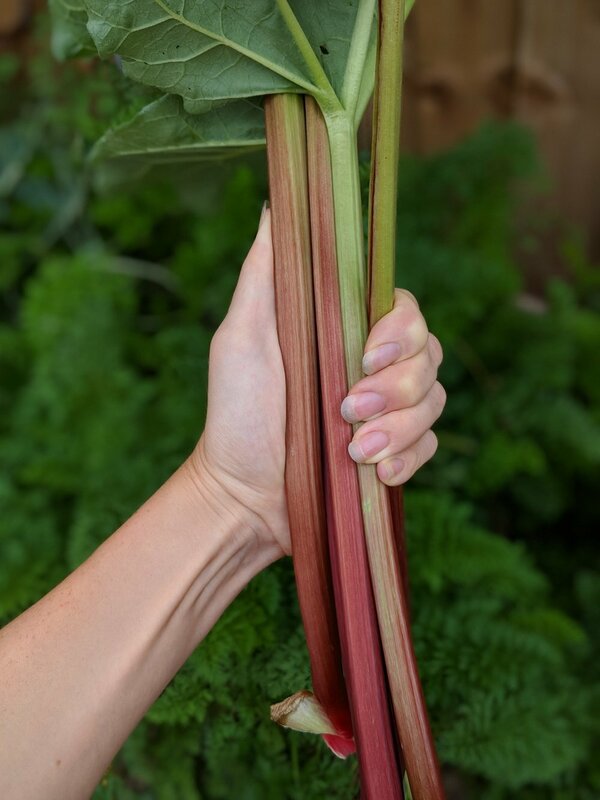 We’ve harvested them throughout the growing season and made a few tasty rhubarb crumbles. We trialled the three plants, one in full sun, one in semi shade and one in shade, and initially the plant in the shade grew very slowly - we were tempted to put it back in the sun. 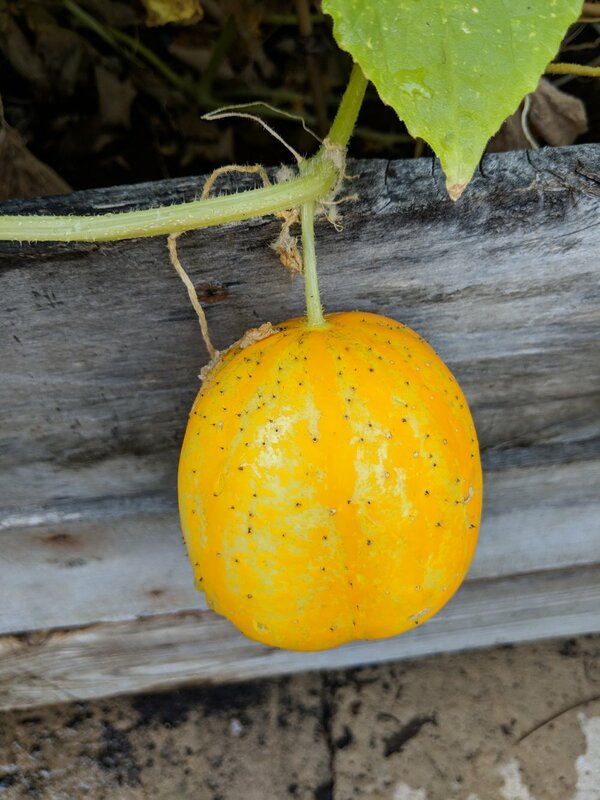 However, after the summer sun came and went, the plant that was the healthiest was…. the plant in the shade. Who knew! 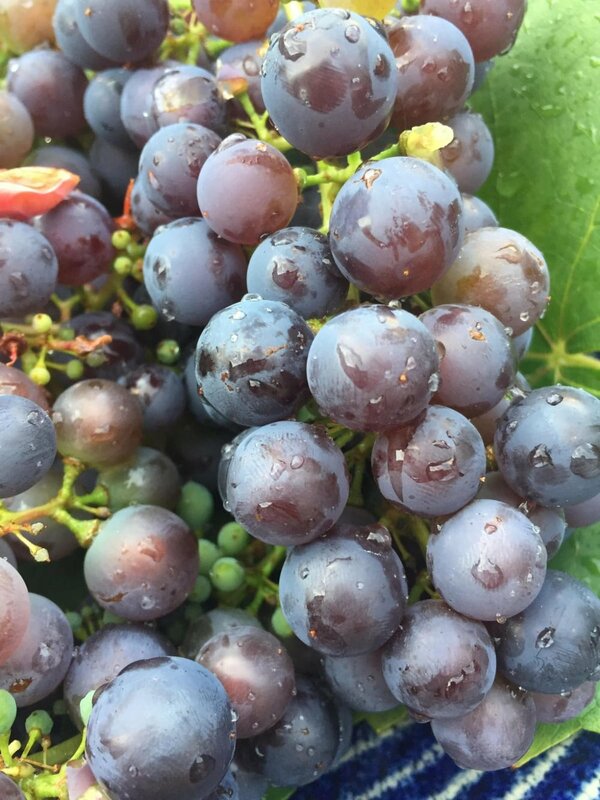 As if we weren’t surprised enough by our figs and peaches, we received a bumper crop of grapes too, from a small grape vine. What a pleasant surprise. We placed this vine in partial sun, as we felt the full force of the sun might have been too much (and we didn’t have space). To get hold of your own vine, we suggest this one from Mr Fothergill’s. Note: We don’t have any photos of our blueberries! We spoke about them quite a lot in the months leading up to Spring, but we had plenty to go around. From July to late August. They did a super job. Start tidying. As the plants die back - after all, most of the plants listed above only last a year, except for our fruit plants - it’s a good time to remove the dying plants and compost them. This helps clear the garden, keeping it clean for next year whilst recycling any leaves or stems through the compost bin. Figure out what will crop in October-December. We have a few plants that are still growing. For example, the carrots and Brussels sprouts will keep going. With the sun changing position, the sprouts aren’t receiving sun, so once our vegetable bed is cleared, we will transfer them there, meaning that the bed will have held a variety of plants over the past 12 months. All the vegetables in the above image came from our garden. To see what we did with these ingredients, see here. What a ride it’s been! We’ve learnt so much from this process and, even though we didn’t successfully live off garden produce for three consecutive weeks, we had plenty of fruit and vegetables for the 3-4 months of summer. Yes, we had a very hot summer, probably the hottest UK summer in mine & Peppe’s lifetimes so far, and that certainly helped, but we had plenty of fresh, organic food to go round. Each piece of fruit or veg might not have been as big as store-bought food, but it somehow tasted much better knowing we grew the plants with our own hands! We’ll keep you updated with our carrots and sprouts - hopefully they’ll be ready for Christmas.